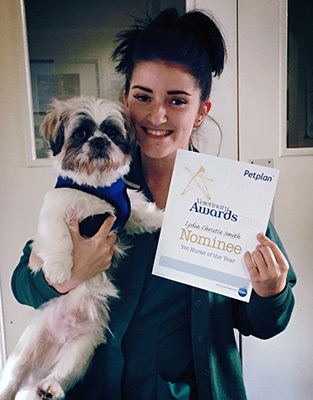 Lydia was nominated for vet nurse of the year in the PetPlan Awards! When Lydia first joined the College in 2010 she knew she wanted to work with animals but wasn’t sure about which sector this would be in. After speaking to course tutors, Lydia enrolled onto the Level 3 Extended Diploma in Animal Management course knowing that this would give her a thorough grounding in the principles of animal management as well as giving her the opportunity to gain experience a variety of work placements. During this course Lydia completed two weeks of work experience within a veterinary practice and realised that veterinary nursing was the career for her! After her course, this veterinary practice offered her a full time position as a student veterinary nurse and, in 2012, Lydia applied for the day release Level 3 Diploma in Veterinary Nursing course. After spending an enjoyable day on a college taster day, Lydia was confident she had picked the right course! Undertaking the animal management course definitely helped me when I went on to study veterinary nursing as it taught me the important basics such as TPR rates for animals, anatomy, housing and husbandry. I have always grown up with animals, this lead me to pursue a career working with them. I also completed two week blocks of work experience at a kennels, zoo, and farm and reptile shop which allowed me to gain hands-on experience with a variety of different species. I really enjoyed the interactive learning sessions, particularly group work and debates. I loved learning about anatomy and found recaps at the end of sessions very useful. I made new friends who shared my passion for animals and found the College staff to be friendly and approachable. I found the blended learning part of the course challenging. It was also hard balancing full-time work and being on call alongside college! You have to make sure you keep on top of your deadlines and don’t be afraid to ask for help if you need it. I would love to become a lecturer; teaching something I am passionate about would be very rewarding. Towards the end of our course the College organised a leavers’ day for us, where various different organisations came along to talk to us and offer guidance. This, alongside the advice and guidance from our tutors, helped us to explore what options are available to us in the future. At one point I was struggling balancing work and deadlines. I was helpfully offered support and a little extra time which took away some of the stress. During the course we had regular learner reviews; this felt like a safe opportunity to discuss any issues (luckily I didn’t have any). It is definitely important to discuss any issues or concerns with your tutors, they are there to help you! Keep on top of deadlines! Remember everyone is in the same boat as you, so don’t be afraid to ask for help! Enjoy it whilst you can. College was the best two years!